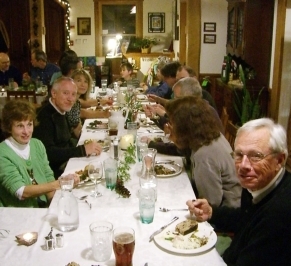 Dining is an important part of Bent Creek Lodge, to us and our guests. In fact, the story of the lodge begins when Jodee quit her corporate job to pursue a Culinary Arts Degree. After graduating she worked as a private chef, on the line at a couple of local restaurants and as an award winning teacher in the Culinary program at AB Tech. She now puts her talents to work not only preparing our delicious breakfasts and afternoon treats but also catering gourmet meals for special occasions. Special dietary requirements or schedules are not a problem. 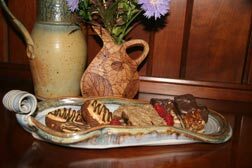 A tasty alternative for any diet from vegan to gluten intolerance is always available. For those with early morning plans, an alternative breakfast is available upon request. Please be sure to let us know of any requirements at check-in. An Evening of Fine Dining for your group of 14 or more is one of the most memorable experiences for families, corporate retreats or just friends staying as Bent Creek Lodge. The lodge’s casual atmosphere and the beautifully presented and delicious meals create an evening few restaurants can match and you don’t have to drive home!! Jodee and her staff cater a three course (appetizer, entree, and dessert) meal for $59 per person for most choices. The price includes coffee, tea, tax and gratuities. They need at least two week’s notice to plan and prepare for your group’s meal. Bent Creek Lodge does not have a beer and wine licence but guests are welcome to bring their own. Groups can choose each menu item from options Jodee prepares or give her a little direction and let her take it from there. I don’t think anyone has ever been disappointed. Dinners are ideal when your group has reserved the entire lodge. Give us a call to check for availability and start planning your affair! Lunches & Meeting Room Set Ups – We often cater lunches for working retreats here at the lodge. Our downstairs sitting room also works great as a meeting room for groups of 10-15. Some groups like the casual seating as it is and for others we set up the room with tables and office chairs. Meeting room reservations include coffee service and snacks. Please call for pricing and availability. Cook Book – Jodee has put together a collection of ninety two of her favorite recipes with tips and notes. It is on sale at the Lodge for $17. We stayed two nights during the fall foliage season, and it was all that we could have imagined. The lodge owners were extremely accommodating to our varied dining requirements (one vegan, one vegetarian and one dairy free). The breakfasts were extraordinarily good! The bed linens were great, and added to the very restful sleep. I would return again, again and again! Asheville has a fabulous vegan restaurant–Laughing Seed. I am not vegan, but the food was scrumptious!